basically, both teams start on opposite sides of the zone. in the middle is a timer/countdown thing. items from a chest on top is going to a chest on the bottom. your goal is to get as many items in the bottom chest. to do this, you switch your lever off so items can transfwer below. you can also turn the opposite team's lever on to slow them. there would be no block placing or anything of the sort so the redstone doesnt break. since right now there is no progress shown on the outside, i suggest battles would be ~10 minutes long. below is a design of my timer thing. i still don't have a place to set this up though. heh. I think it'd be good if the two levers were next to each other. But nice work on the ideas. 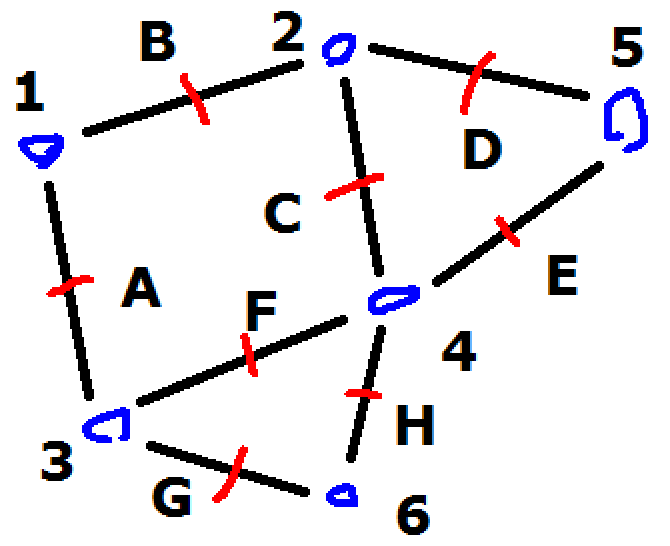 With spawn bases (blue) as nodes and red as objectives between the spawns. Controlling an objective could then allow you to use either spawn that it's connected to. (16:24:27)<BlaBla44>Oh yes I wrote down some notes before sleeping one of the recent nights. I had an idea for a BG-like system, but instead of all the complications in the BG, there's be just like a slice of land, with two bases on each side, where each team spawns. 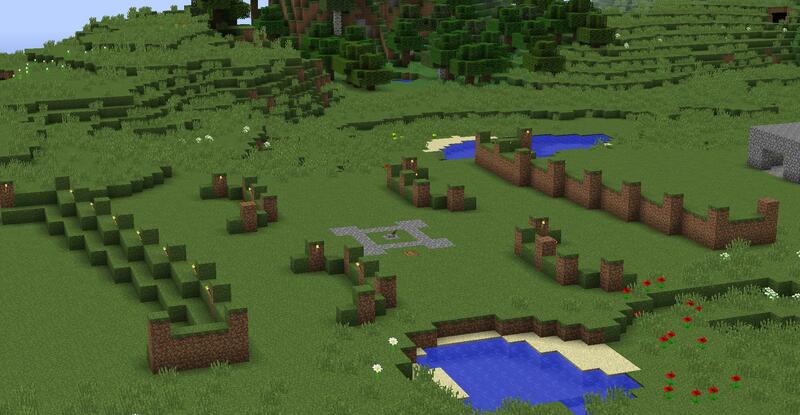 Digging, TNT and so on is forbidden, so you only have sword, bow, armor, and use the terrain during the battle. You try to push the enemy team as far back as possible, and if you push them back far enough (maybe beyond some line, or beyond some area where you manage to e.g. replace a flag), you win their base. (16:36:03)<blotz>what do you mean by push back? (16:51:35)<BlaBla44>True, but I think it'd depend on the settings. Maybe you could say you're not allowed to run a lot past the enemy team, or something. (17:27:17)<blotz>problem: what if they dont hear the sound? For example, if there were a battle between the famous Green Front and Yellow Front, where Green Front used spawn 1 and Yellow Front used spawn 2, trying to capture B. Green Front won, so they control B, this means they can organize a battle where they use either spawn 1 to fight for objective A or spawn 2 to to fight for objective C or D, because B lies between 1 and 2. As for the levers, I think the whole redstone stuff could be underground, and just have the only above-ground thing be a small area with 2 levers close to each other, maybe. Having them left or right isn't really any less fair than either side, as long as there's the same distance to the levers from each spawn (or the distances balance out if there are two). So we built a test zone in an area I've called "Trenchland" (built a nether horse road to it in the west direction from spawn). Tested the gameplay: Blotz built a clock which counts down from 20 minutes (or rather ~20:20), and after that it gives a sound signal to say the defenders won. However, another hopper clock counts down from 10 minutes (~10:08), but only when the lever in the center points in one direction (which it would make sense was the direction of the attackers). I and TMC played attackers vs Fiah and Yqt as defenders and they won, where we had controlled the center around 8:30 according to the hopper timer. It seemed like people were satisfied with the concept, so the plan is to make more spawn bases with more objectives between, like in the sketch above, in the area. When there are enough spawns and objectives, the region could work similar to the Battleground, with teams being able to own the objectives. Of course areas like these could also be built in other locations if you want desert themes and so on, but that would be independently of this project. 1: Everyone can contribute to the region by suggesting locations of new objectives and spawns, and once approved, build the battle zone areas by landscaping etc. so that the zone is balanced for both teams. Just type here if you want to sign up for designing a zone. 2: The spawns will have to be approved a bit and should be standardized (but until that's finished we can easily work on 1 just by marking the spawn areas). I'm considering a circular design so that the spawns can be connected with zones/objectives in any direction without having your route out blocked (although there'd probably be a few pillars to hold the roof). 3: The timer system in the center could probably be improved a bit, so it's simpler. I think we should refine this design before installing it in a lot of zones. But for our test it worked well. What do people think of this spawn base style? 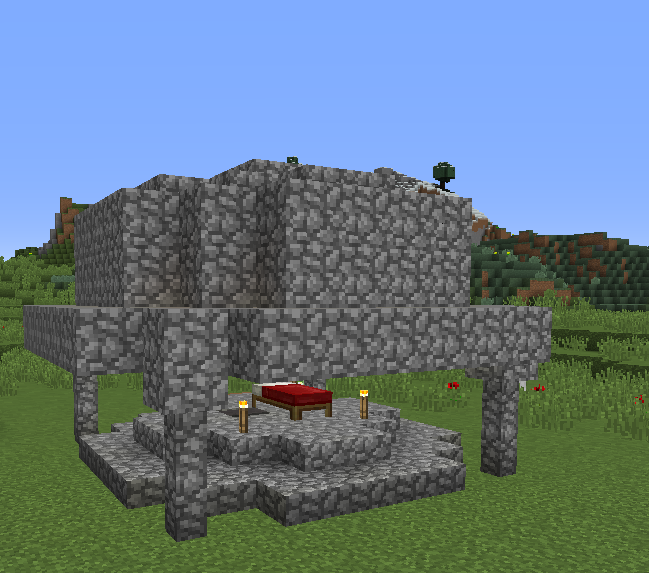 It has 4 large chests, 8 workbenches in the ceiling, an anvil and bed where you spawn. Spawn is elevated a bit so that, combined with the shell-shape of the roof, shooting arrows into the spawn is made harder. The overall-shape is roundish and as symmetric as possible so you can fight in any direction from it. My biggest issue with it is probably that it's pretty ugly. That may be the cobble, but it's cheap to make which it should be so Idk. hmm, we need to get a master builder in here. jk ill just like mess around in single player so it doesnt look like a hat. I've tested a new clock design based on Atomic's idea to have the lamp lights count down until you win. Where 9/9 means 8 lamps are lit up and the 4 lamp arrow at the end indicating victory. Basically the 1500 = 10:00 could be replaced by any amount above 987. 1/9 is never lit up because a signal likes to light up lamps diagonally and I couldn't yet make a design that can lit up just the first lamp (the redstone is getting tight in there). It would've been cooler if one lamp corresponded to e.g. 2 minutes but I guess this way it's ok, even though the intervals don't make perfect sense. I don't see a way to make it more sensical atm. Having as much as 8 countdown lights might also be a bit excessive as now the objective requires about 27 meters of long flat land. Maybe reducing it to 6 would be better so they start when there's around 5 mins left (4:56) to control for winning. Edit: I've reduced the design from 8 to 6 countdown lamps with the first two counting down when there's 4:56 left. Actually 5 since the 2 first used to light up at the same time, so I removed one of them. There hasn't been any complaints on the designs so I'm implementing them in the first battle area now. hmm looks like kal and tuto want a trenchland... maybe we can have a double event?